Two South African Navy (SAN) vessels sustained minor damage when they were involved in a minor collision last week. 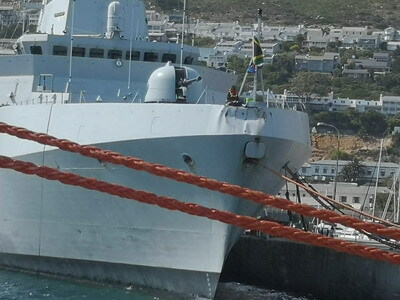 The SA Navy confirmed that there was a minor berthing incident on the afternoon of Thursday 13 December when the SAS Spioenkop collided with SAS Drakensberg while entering Simon’s Town harbour, guided by the Naval Harbour Master and the Navy tugs. SAS Spioenkop was returning from sea where she conducted engine trials when the incident occurred. There was a mechanical or communication system deficiency on-board the frigate at a critical time when the ship was supposed to reduce speed. Despite valiant efforts from the tugs to reduce her speed, SAS Spioenkop collided with SAS Drakensberg which was berthed alongside. Both ships sustained minor damage above the waterline. The damage will not affect either the ships’watertight integrity, the SA Navy said in a statement. The cause of the incident is to be investigated and a Board of Enquiry will be established to determine circumstances that led to the incident, an SA Navy Public Relations Officer said. The SAS Drakensberg sustained minor damage in February 2016 when it was hit by a practice round from the strike craft Isaac Dhyobha, which was trying to clear its 20 mm cannon during Armed Forces Day in Port Elizabeth. The port deck sustained damage whilst berthed in harbour.